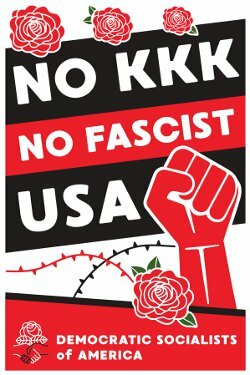 For all DSA members and chapters, here is our post-Charlottesville organizing guide. There are some great tips here about running meetings, doing outreach, and finding concrete ways to help. You can download the guide under the “Attachments and Resources” section of this page. We also have a great DSA anti-fascist, anti-hate sign available for download. You can print this out for rallies in your area, or to put in your window. We cannot allow the organized neo-Nazi movement to use the Charlottesville tragedy to consolidate and expand their violent offensive against people of color and against the left. Therefore, a three pronged strategy should structure our work. Defend our communities and institutions from neo-fascist violence. Continue to organize a grassroots multi-racial working class movement fighting for visionary, transformative reforms like Medicare for all. Fight the battle of ideas – fight racism and anti-Semitism with socialism, not with neoliberalism. People everywhere will be looking to groups like DSA for a community of support and ways to take action, so we recommend you organize general interest DSA meetings to recruit folks for near and long term action.